Ransomware has become so prolific that it is no longer a question of “if” you are going to get hit with any kind of malware. In a nutshell, it is a question of when. If Ransomware hasn’t held your data hostage, it’s just a matter of time. For a ransomware offense, some proactive measures must be taken that will attempt to keep ransomware out of all user and server- based systems. 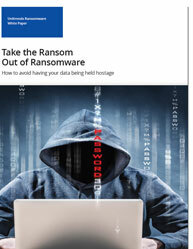 This whitepaper gives insight into the rise of ransomware and provides some guidance on protection, backup, and the recovery solutions that organizations should implement. Key takeaways from this whitepaper: Present scenario of ransomware today How does an enterprise make sure they never have to pay ransom? Best practices & recommendations to reduce risk and assure continuous recovery and data protection What does a good backup strategy look like for ransomware protection? 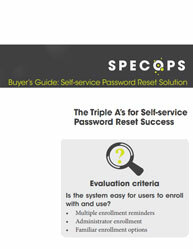 If you have identified the need for a self-service password reset solution, you are likely familiar with the cost-savings, usability, and security benefits. The next step is identifying the criteria to use when evaluating the desired outcome of your investment. A self-service password reset and management solution not only reduces the number of help desk password tickets but also enhances the productivity of an end user by averting unnecessary and prolonged waits. This whitepaper provides insights for achieving significant savings and maintaining security requires looking at what we call the Triple A’s: Adoption, Authentication, and Access. The right balance is attainable with a solution that is: • Easy to adopt - with various enrollment options • Highly accessible - no matter the device and location • Secure yet flexible - permits multifactor authentication with authentication choice • Cost effective - uses existing assets such as Active Directory, mobile devices, and authentication devices. Are you reaping the full benefits of security technology convergence? Using technology alone is a practically impossible and cyber-security protection requires the convergence of physical security and cyber-security. If not, Security Operations and Intelligence Analysis tool can help you do that by securing the integrity of your business data and processes. 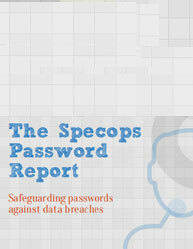 Download this free white paper to learn about: What is the security technology convergence? How Security Operations and Intelligence Analysis tool can help your business? How and when a disruption of sensitive data may occur? How to integrate SOPHIA within the organization? How technology convergence using SOPHIA can streamline your business? This paper examines strategies to improve an organization’s overall cyber-security posture and manage risk by converging physical and cyber security by collecting real time data on the organizations people, systems, and processes using Covenant Security Solutions Security Operations and Intelligence Analysis (SOPHIA).